Once you've created a budget, you can edit, move or delete it at any time. This can be useful if want to change a specific event within a repeating budget, amend a budget to better reflect your earning and spending or change the date it occurs. You can perform these changes from the Budget page, Calendar page and Trends page. If you have set up more than one budget for this category, you can see these all by selecting View all category budgets. If you choose to edit a transfer budget, PocketSmith will display both the income and expense side of the transfer as two separate budgets. You can select either of these and, any changes you make to one will automatically be applied in the other. If you choose to edit a transfer budget, any changes you make to one side of the budget transfer will automatically be applied in the other. You can use the Trends page to look at your earning and spending over time. You can choose to view any particular budget on the Trends page using the side panel. This will open the Events categories window under the Budgets tab. This window shows all budgets related to the category. Click on the budget you'd like to change. If you have chosen to edit a transfer budget (like the one shown in the image above), PocketSmith will display both the income and expense side of the transfer as two separate budgets. You can select either of these and, any changes you make to one will automatically be applied in the other. Make the changes within the budget form (you can switch between the SIMPLE BUDGET FORM and the ADVANCED OPTION by selecting these options from the bottom left corner of the form). Once you're happy with your changes, select Update. 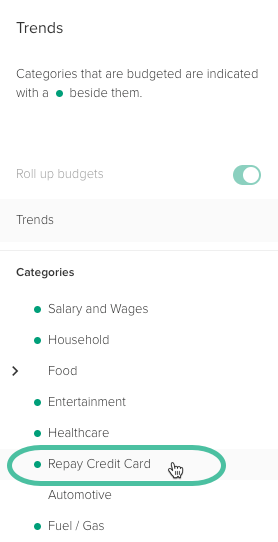 You can use the Trends page to look at your earning and spending over time. You can choose to view any particular one of your budgets on the Trends page using the side panel. 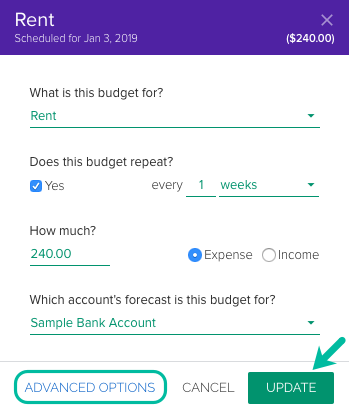 If you have chosen to delete a transfer budget (like the one shown in the image above), PocketSmith will display both the income and expense side of the transfer as two separate budgets. You can select either of these and, once you choose to delete one budget, you'll have the option to simultaneously delete the other. You can quickly move a budget on the Calendar with a simple drag and drop. Navigate to the budget event you'd like to move and click and hold it with your cursor. You'll then be able to drag and drop it to another date on the calendar. If this is a one-off budget, then once you move the budget, the Calendar page will automatically re-load and showing the budget on the new date. If you're moving one budget event within a repeating budget series, PocketSmith will ask how you'd like this change to be applied. For example, whether you'd like to just move this budget event, all relating budget events within the repeating budget. If you make changes to a repeating budget, you'll need to choose how these changes are applied. Because a repeating budget has multiple budget events attached to it (based on the frequency you've chosen for your budget to repeat), you can apply the changes to just one budget event, the whole repeating budget or all future budget events.